Save the State of the Union! Obama wants an hour for his speech. Here’s how he can do better in 10 minutes. 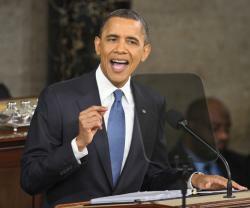 For a political speech, the State of the Union is surprisingly riveting drama. The pomp of the president entering the legislative chamber to rousing applause as members of Congress jockey to get a presidential nod or handshake makes good TV, and suggests that what happens in Washington still matters. But once the Republican response has been delivered and the clamor of cable commentary subsides, the State of the Union fades quickly. There are no visuals during the speech to reinforce the message; there are too many issues addressed perfunctorily; and the carnival nature of the event distracts from the points being made. Americans forget overnight what the point of the speech was. This is a major problem in any year, but a special one for this president, this week, since he desperately needs to make his case for re-election to a skeptical American public. Since the media focus has been almost exclusively on the wild and crazy antics of the Republican primary, the president has had few opportunities to grab public attention. He has been overshadowed by the brilliant performance art/political campaign of Newt Gingrich and the unintended humor of Rick Perry and Michele Bachmann. So what should the president do on Tuesday night to recapture the interest of the public? Here is a proposal: President Obama should radically change the nature and format of the speech. He should dispense with the timeworn tradition of merely standing in front of Congress and talking to them. Instead, he should distill his speech to four essential points and reinforce those points with very strong visuals. The audience the president needs to engage is the public, and the public won’t connect with his ideas unless they see what he is talking about. So here is an outline of the four points, and the visuals to go with them. The entire speech need be no more than 10 minutes. The longer and more diffuse the speech, the less memorable. At 10 minutes, it would be perfect for viral distribution on YouTube. Tonight I stand before you to make four simple—but critical—points. First: Jobs. Take a look at this simple chart of job growth over the past three years. Compare what happened during my predecessor’s last year in office and my presidency. We are getting the job done; They did not. My ideas—though disparaged by the same wise folks who created the crisis in the first place—have succeeded. Theirs failed. We have created 1.9 million private-sector jobs over the past year and cut the unemployment rate from 9.4 percent to 8.5 percent. Second: Average family income has been flat since 1979—see that dark red line—while the income of those at the top has gone way up—look at the orange line. On top of that, the tax rate paid by those at the top has gone way down! That is why the percentage of total income going to those at the top has skyrocketed, while the number of people in poverty has reached an historic high—more than 46 million, or 15 percent of our population. This comports with neither our sense of fairness, nor any theory of how we will compete in the global economy. That is why I am proposing something endorsed in the bipartisan Bowles-Simpson report, and by numerous leading elected officials of both parties: ending preferential treatment for capital-gains income. That unearned income is now taxed at a top rate of only 15 percent, while folks who actually make their income through hard work face a top rate of 35 percent. I am thrilled that my good friend Mitt Romney paid taxes of only about 15 percent on his sizable income—and I am sure it was all done properly. But frankly, Mitt, I am not sure why you don’t pay the same rate that Warren Buffet’s secretary pays. So in your honor, we are going to call this the Mitt rule: All income is taxed the same—up to a top rate of 35 percent. Third: Deficits have ballooned over the past 30 years—look at this chart—primarily under the leadership of presidents Reagan and the two Bushes. Those deficits ballooned not because of the stimulus spending that saved us from even greater economic disaster, but because of the tax cuts put in place by my predecessor and the wars he began. So, I have ended the Iraq war, will end the Afghanistan war by 2014, and also encourage you to repeal the tax cuts for those earning over 1 million dollars a year as soon as you can. We also all know that the deficit going forward is almost exclusively a result of the explosion of health care costs. Medicare and Medicaid are the entitlement programs that will drive us bankrupt, not Social Security. Yet I am proud to tell you that because of the health reform act you passed last year, the rate of growth of health care costs is the lowest in many years. But that is not enough. We will do better by reforming Medicare and Medicaid even more and gradually raising the retirement age for Social Security. And as my good friends Newt Gingrich and Mitt Romney said when they actually served in government, we must use an individual mandate to broaden health care coverage. Fourth and finally: National security. Osama Bin Laden is dead, and thanks to drones and covert operations, we have eliminated nearly the entire leadership of al-Qaida. Our gratitude to our armed forces and security agencies for their exemplary role in these tough missions knows no limits. The state of our union is strong, and will only get stronger if we have the courage to do what is right—and not what those who would merely pander would have us do.